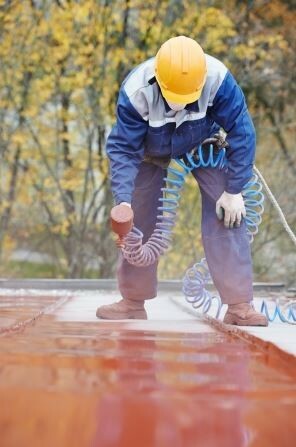 You might be under the impression that wintertime is the only time of year you need to prepare your commercial roof for, but that couldn’t be further from the truth. It’s also important to do it as you head into the summer season since the hot sun can wreak havoc on your roof. Let’s take a look at a few of the ways you can prep your roof to be ready for the summertime. Start by inspecting your commercial roof. Are there visible cracks or blisters located on the surface of your commercial roof? Do you have gaps forming around vents, skylights, and HVAC units due to a lack of caulking? Have any nails or screws come loose from your roofing materials and compromised the integrity of your roof? You won’t be able to answer any of these questions if you don’t have a professional come in and check out your roof. You should have regular roof inspections to see if any signs of trouble exist. Both the inside and outside of your commercial property should be examined for leaks in your roof. After you’ve had a roof inspection done, a roofing company should be able to tell you what repairs you need to have made. Don’t ignore the report they provide for you. While there might be some projects that can wait, you should address any major problem areas right away to prevent your roof from causing issues for you this summer. You want your roof to be ready to deal with rainstorms, the hot sun, and whatever else summer throws at it. Continue to monitor your roof throughout the summer. Even after you’ve had repairs made to your roof this spring, it’s important to continue to keep a close eye on your commercial roof throughout the summer. If you ever notice discolored ceilings inside or water pooling on the surface of your roof, you should have a commercial roofing company come back out to inspect it again. It will help you avoid heading into winter with problems with your roof. Do you need a commercial roof inspection, replacement, or emergency repair done? Contact Ray Roofing Supply at 330-452-8109 for all your commercial roofing services.